From Santiago de Compostela in the north-west to Granada in the south-east via Madrid in the centre, Enchanting Spain reveals the fascinating breadth and depth of this exuberant country. The Moorish Alhambra, Toledo’s Jewish quarter, the Roman amphitheatre at Mérida and Barcelona’s Sagrada Familia, the famously unfinished cathedral, each show a different aspect of Spain’s complex history, now intermingled with fabulously contemporary museums and art centres. The major towns sparkle with life, which visitors can share through the vibrant night scene, the delicious food and wine, the flamenco performances and the abundant festivals. The landscape is diverse and dramatic, whether you are discovering the sun-drenched beaches of Andalucía, hiking in the Picos de Europa or taking a trip down the Guadalquivir River. 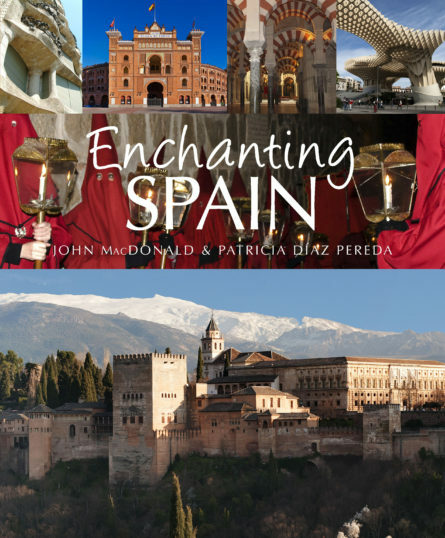 Enchanting Spain is a portrait in words and images of both the familiar and the unexpected pleasures of this vibrant country. John MacDonald has written for many Spanish and international publications and has a special interest in Spanish history. He studied journalism, photography and archaeology at the University of Exeter and UCL. He shares his time between the UK and Spain. Patricia Díaz Pereda studied at the Complutense University of Madrid, and has worked as a television director and for a media publication. She is passionate about her homeland and has written many articles for magazines as well as contributing to Descubrir España, a National Geographic publication on the subject. She lives in Madrid.